The announcement broke with decades of policy and was opposed by Arab and European leaders. A Palestinian was killed and 176 were wounded by Israeli army fire Friday as thousands of Gaza residents protested near their sealed border — part of a weeks-long campaign to end a decade-old blockade of the territory. Later Friday, vandals burned a fuel complex and a conveyor belt on the Palestinian side of Gaza's main cargo crossing with Israel, causing more than $9 million in damages and disrupting the import of diesel fuel and building materials, the military said. Friday's clashes offered a preview of what will likely be a much larger protest — and possibly a border breach — on Monday when the United States relocates its embassy in Israel to contested Jerusalem amid Palestinian outrage. President Donald Trump's decision to recognize Jerusalem as Israel's capital and move the embassy there "is causing the volcano to spew," said 25-year-old protester Ahmed Deifallah as he stood near the Gaza border, a Palestinian flag draped around his head. Deifallah, who is unemployed like almost half the Gaza labor force, said he would also join Monday's protest and is not afraid to die. "We are used to confronting the (Israeli) occupation with our bare chests," he said. "We are used to wars and no one with us but Allah." Friday marked the seventh weekly border protest since late March. The demonstrations have been organized by Gaza's Hamas rulers, but are fueled by despair among the territory's 2 million people. The vast majority are barred from travel and trade, while the blockade has gutted the economy. As in previous weeks, thousands flocked to five tent camps near the border — some 15,000 people, according to the Israeli military. From the camps, smaller groups moved closer to the fence. They threw stones, burned tires and flew kites with burning rags attached to them, hoping to steer them into Israel to set fields on fire. The area was quickly engulfed in thick black smoke from the burning tires. Israeli soldiers, some crouching behind sand berms, fired live bullets and tear gas volleys from the other side of the fence. 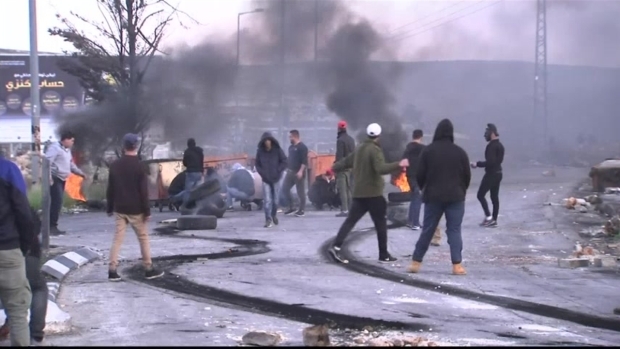 The Israeli military said protesters also threw pipe bombs and grenades toward Israeli soldiers and damaged the fence. Later Friday, Palestinians vandalized a fuel complex and conveyor belt on the Palestinian side of Gaza's main cargo crossing, Kerem Shalom, the army said. It said the fuel installation is the only way to bring diesel fuel into Gaza for operating generators for hospitals and other key facilities. The military distributed a video showing Palestinians cheering as a fire was set. It was the second such attack on the facility in a week. "Hamas continues to lead the residents of Gaza to destroy the only assistance they receive," the army said. Nissim Jan, the director of an Israeli company that operates Kerem Shalom in partnership with private Palestinian companies, said he spent large sums to repair last week's damage. "This time I can't repair and will not repair it. Where shall I bring money from?" he said. Friday's death brought to 41 the number of protesters killed since March 30. In the same period, more than 1,800 were wounded by Israeli fire. Despite such risks, Gaza's Hamas leader, Yehiyeh Sinwar, has said he expects tens of thousands to participate in Monday's protest. He has raised the possibility of a mass border breach, comparing protesters to a "starving tiger," unpredictable and full of pent-up anger. Israel has said it will prevent any border breach and has stuck to its open-fire policies, including targeting "main instigators" and those approaching the fence, despite growing international criticism. There are growing concerns that if Israel and Hamas dig in, a widespread border breach could lead to large numbers of casualties. The protests are part of a campaign to break the blockade imposed by Israel and Egypt after the Islamic militant Hamas overran Gaza in 2007. On Monday, they are also aimed at the inauguration of the U.S. Embassy, which comes five months after Trump recognized Jerusalem as Israel's capital — a decision that outraged Palestinians as blatantly pro-Israel. The Israeli-annexed eastern sector of Jerusalem is sought as a future Palestinian capital — at least by those supporting Hamas' political rival, West Bank-based Palestinian President Mahmoud Abbas. Hamas seeks an Islamic state in the entire historic Palestine, including what is now Israel, but has said it is ready for a long-term truce. Another large-scale protest is planned for Tuesday, when Palestinians mark their "nakba," or catastrophe, referring to their mass uprooting during the Mideast war over Israel's 1948 creation. Hundreds of thousands of Palestinians were driven out or fled homes in what is now Israel. More than two-thirds of Gaza residents are descendants of refugees. Meanwhile, Gaza government officials announced that Egypt will open its border with Gaza for four days starting Saturday. Helping reinforce the Israeli blockade, Egypt has kept the Rafah crossing point, Gaza's main gate to the outside world, closed most of the time since the Hamas takeover. In Jordan, about 7,000 people participated in a "nakba" rally in an area close to the Israeli-occupied West Bank. Palestinian refugees and their descendants now number several million people in the region, including more than 2 million in Jordan. Friday's rally took place before a large stage with a view of the Dead Sea and the West Bank. One man walked onto the stage with an effigy of Trump dangling from a noose.